Creative Fun for All Ages Toy: Sands Alive! Because it’s really hard to buy TOYS for my boys these days, I wanted to showcase a few that they still play with as we near the holidays in the hopes of sharing with others who have difficult-to-buy for kids. I should note, I have a 9 year old and one who is about to turn 12 so we’re definitely in tween I-want-technology-only land but the kid in them still comes out once and awhile. Cole (9) the other day was playing with his Sands Alive Glow Sand kit ($23.99, Amazon) and it reminded me that this is a good one. We’ve had some Sands Alive! toys for awhile but received a Glow Sand version last summer after I saw a demonstration of the glow version in a very dark booth at a blogger event. 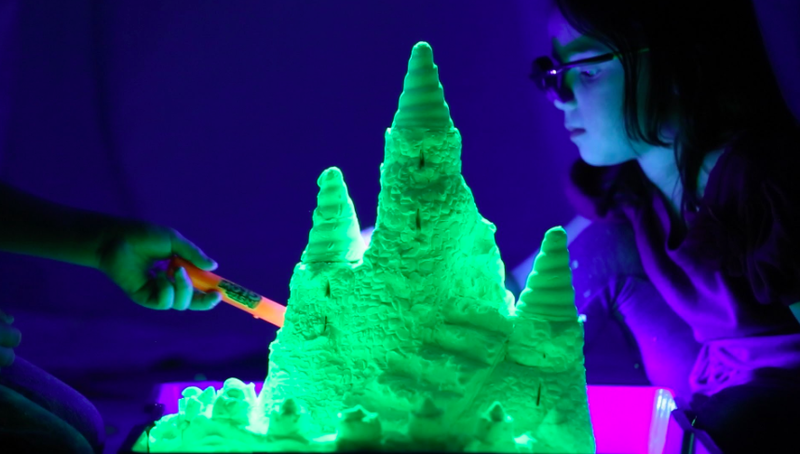 There’s just something addicting for all ages about playing with moldy sand and the kids love that this version glows in the dark. This set comes with UV glasses, a UV pen light a tray andthe sand. It’s pretty nifty and this is a toy my guys have returned to a number of times so for that, I call this one a win. We pull this out a lot when we have guest over too and it’s always a hit. Get the Sands Alive! 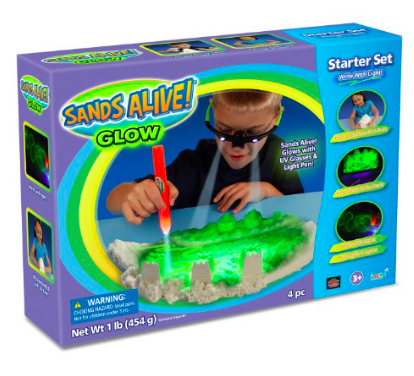 Glow Sand Kit for $23.99 on Amazon. Filed Under: Games Tagged With: featured, holiday toys 2015, sands alive!